How do you like my new RockerJewlz banner above? Would you believe it was a prize? I worked with Jenn from The Village Peddler on Etsy...it was really fun and fast...she was into it so it was a great experience. I always wanted to see RockerJewlz against a night sky with mulit-colored stars and now I have it! I'm coming down off the stress of having a close family member being rushed to the hospital with what she thought was just a flu...but she'd had it for a week and is nearly 80 years old. Doctors discovered she was so dehydrated it almost completely destroyed one kidney. It shrunk to an unusable level and the heart had some permanent damage as well...aye yai yai! The lesson here is it's easy to NOT know you are dehydrated and that it doesn't take long for it to practically kill you, no matter what your age and that flu viruses affect the elderly in a very intense manner! Good news is, she pulled through with her amazing children staying with her in the hospital on shifts over all the 24 hours in a day for 10 days and she turned around with incredible improvement each day and gets to return home tomorrow. My own experience has been interesting. Since I wasn't able to travel the long distance to be there with her I was not involved with the round the clock care. I did that, though, when my mom's life was ending and in hospice in her home. I discovered this past week that the fear & emotions I experienced over my mother came to me again, but at a much lighter level, and one where it didn't deeply affect me to the point of not being able to physically or mentally get through a day. In other words, it didn't drop me to my knees this time. Still felt nervous and anxious, like with my mom, but just wouldn't allow myself to enter the deep wells one can easily fall into...and get there before they know what the hell happened. It was wonderful to be able to function quite normally and stay busy enough to work through the anxiety and stress without even consciously telling myself to do it. Looking back, I think my survival mode said "hey, you've been through ALL of this before and you can let it almost kill you or you can just use your faith, your calming breaths, and your experience to keep it from being like the first time". It's not necessarily easier, but it sure isn't as terrible. When my husband came home after being one of the caregivers, though, a tightening around my heart loosened and relaxed. I didn't even know it had been there. I'd felt it happening early on but breathed my way through it and didn't feel it anymore...well, surprise, surprise it had been there the entire time! So... was this story enough of a smack in the face & "intimate" enough for some of you?! Don't let me scare you away. Luckily I won't have many stories that intense to share often. I'm surprised that I feel a little weary and just don't want to chat on the phone or text my buddy like I usually do. It just feels tiring. Typing it up on this blog, however, feels just right...doesn't take the same energy it does to verbalize the whole escapade! Okay...now onto to lighter fare! Bunnies, ducks, girly paper punches (and more) are in MomsArt studios so they'll soon be seen for sale on Etsy as confetti & stickers. That pink heart up there isn't a paper punch, it's just a sweet reminder that Valentine's Day is coming fast, so be prepared! 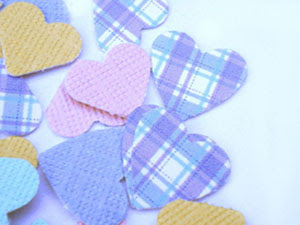 You can find heart & cupcake jewelry at RockerJewlz and paper heart & kisses confetti & stickers at MomsArt to embellish your scrapbooks & note cards & tags for all your sweethearts. 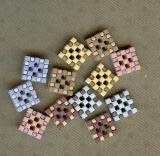 I'm announcing that hearts will now be joining cupcakes year round in my MomsArt shop and RockerJewlz as well. 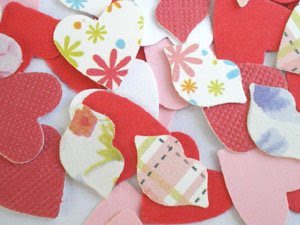 Since I was featuring them in my paper crafts & jewelry, I thought, heck, hearts are good ANY time of year! your traditional reds. Jewelry is being added every few days. See the previous blog for exciting news about that! 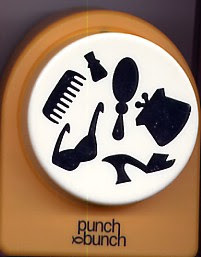 I've ordered alot more paper punch patterns that are so fun I can hardly stand the wait! I will show you some pictures of them when they arrive, so come back to read about and see those in my next message. past 2 years and it has evolved into an artistic chemistry that has resulted in a magical bond. 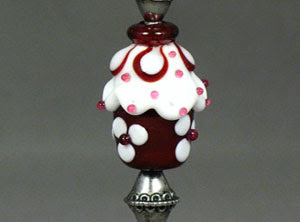 Due to their love of all things cupcake, Julie, a jewelry designer, began to request custom glass (lampwork) cupcakes of Payton, wondering if her imagination could become reality. Payton, a glass artisan, accepted any and all challenges presented to her, teaching Julie about the intriguing properties of glass along the way. Payton knew how glass tended to move and morph beneath her torch’s intense flame but even with that knowledge, she was still always in awe as to what the glass would reveal to her when lifted from its cooled oven. This mysterious quality convinced Payton she must never assume what results would form and thus reveled in the thrill of playing with glass requests from artists like Julie, who would take her inspiration and draw it on paper and tweak the design with Payton until they agreed on the finest detail of color, shape, size, harmony and contrast. With these limitless edges of imagination, these two artists have in a sense created a marriage of passion and dedication to discovering the next best thing in glass and therefore, custom jewelry design. It is a rare gift for these two artisans to have found such partnership and a gift to share. 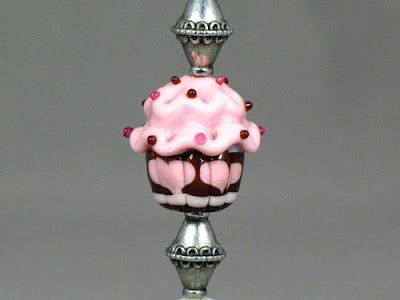 RockerJewlz and the Green Glass Café are now thrilled and excited to announce the revolutionary Deluxe Fantasy Dream Cupcake Jewelry!These cupcakes are bigger than ever measuring up to 26mm versus the more commonly known average sizes. Truly one of a kind (OOAK), these glass cupcakes are loaded with patterns and color combinations never seen before in the glass art world! Plaids of raspberry, dark pink and red…black and white hearts set against mahogany colored cake draped with dark pink layers of frosting with rings of color surrounding the sprinkles. If you have any experience with glass cupcakes, you know these are not your every day cupcake bead descriptions…we just know your mouth must be watering by now. 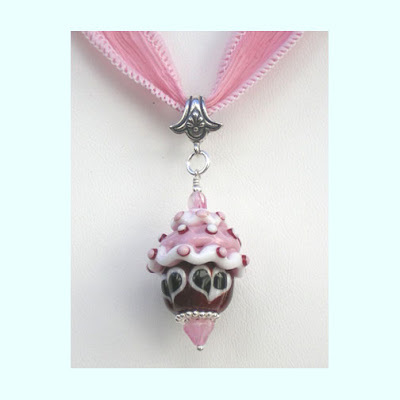 So come and satisfy your curiosity by joining us online to obtain finished Fantasy Dream Cupcake jewelry from Julie at RockerJewlz and experience the thrill of designing your very own custom cupcake beads with Payton at the Green Glass Café. Oh man! You have never seen cupcakes like the Fantasy Valentine series Payton Jett and I created! I drew pictures of my cupcake visions and Payton said, "Bring it on, I'm goin' for it!" I can always count on her to blow the lid off boundaries. 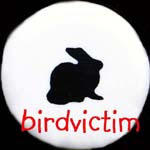 We designed a whole new idea in creating deluxe glass cupcakes that will be noted in lampwork & cupcake history. 15 more will be made, but only RockerJewlz on Etsy will have the originals! We've not seen ANY cupcakes that contain the awesome detail you see here and in the other 7 totally different cuppies on their way to my studio. 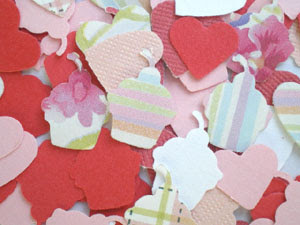 Heart cuppies, dotted cuppies, even ringed sprinkles! Sheesh! 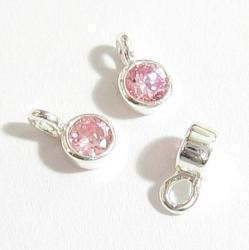 These are most likely bigger than you are used to, some as tall as 26mm and no two are even similar in design. Even using repeat colors doesn't keep these from being incredibly unique, so leave a comment if you want to be notified when these are ready for viewing so you don't miss out. 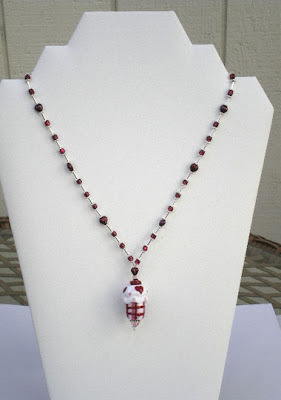 more whimsical jewelry to branch out from my original design styles. As for my MomsArt paper shop I just completed my first art piece...4 whimsical rowhouses stamped and hand colored with pastel pencils, bordered with teeny stamped dots in a variety of colors...really sweet! The rowhouse original will be listed tomorrow at MomsArt .Etsy.com and the new cupcake designed jewelry should be available in 2 weeks....but I have tons of other fabulous cupcake earrings, pendants and bracelets available now if you just can't wait! So come back soon...and leave a comment with your email address if you want direct notification when these new Deluxe Fantasy Cupcakes are available as jewelry. I will have THE most AWESOME news by tomorrow about THE most incredible glass cupcakes you have EVER seen...custom designs not even touched on yet in the cupcake world until now!!! I GUARANTEE TO BLOW YOUR MIND by January 6th!!!!!!!!!!!!!!!!!!!!!!!!! !